Macau’s pacapio Chinese lottery game will celebrate its 170th year of continuous operation next year. 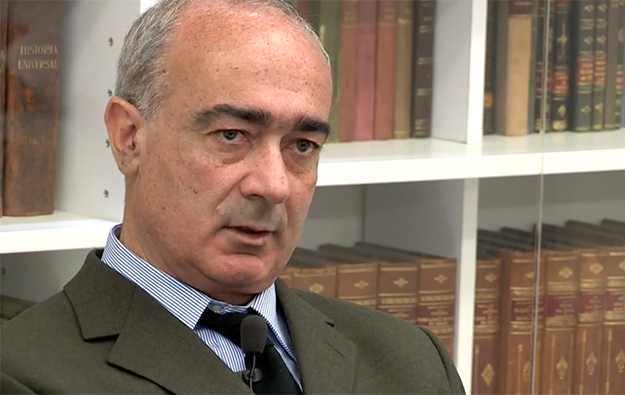 That was just one of the facts brought to light when Jorge Godinho (pictured) – a visiting professor at the University of Macau, teaching gaming law and anti-money laundering law – was researching his new three-part publication “Direito do Jogo” (“Gaming Law”, in English). It is in Portuguese, one of Macau’s two official languages, and tackles the legal history, legal concepts and legal practices of Asia’s most famous gaming jurisdiction. Under the legal system inherited from more than four centuries of Portuguese administration, Portuguese still is used in the drafting of the city’s statutes. “The first volume is essentially conceptual. It gives the interdisciplinary basis of gaming law – including the role of contract law – and delves a lot into the history of games of chance, but also lotteries and betting,” Mr Godinho told GGRAsia. “There is going to be a second volume devoted to a specific analysis of the industry and games of chance, lotteries and betting. “Finally there will be a third volume: the criminal law part, looking at gaming crimes, plus the prevention and detection of money laundering in the gaming industry,” he added. “Volume one is more academic. Volume two is for everybody – including operators. Volume three is going to focus more on criminal law and be of interest to persons that have an interest in criminal law and the prevention of money laundering. So in the gaming industry that would include compliance officers, lawyers involved in criminal cases and so on,” Mr Godinho explained. The first volume was published on Wednesday in Macau by Fundação Rui Cunha. The philanthropic organisation was started by Rui Cunha, the legal adviser of former Macau gaming monopolist Stanley Ho Hung Sun and an executive director of Mr Ho’s SJM Holdings Ltd. The foundation aims to contribute to the development of the legal system of Macau, a special administrative region of China. Mr Godinho for his part describes the three volumes of ‘Gaming Law’ – volumes two and three are currently “past the 50 percent mark” in terms of the writing, he says – as “part textbook, part thesis”. It is the fruit of his more than 10 years in teaching gaming law topics as they apply to Macau, and a record of the intellectual and administrative background to a unique gaming jurisdiction. “If anyone is teaching a course for 10 years or more, something should come out of it… not just papers in academic journals,” he told us. A topic touched on in volume one is that in the second half of the 19th century, one of the most popular gaming-related activities in Macau was betting on who would pass the famously difficult imperial examination that was the key to civil service jobs in China during the Qing Dynasty. The wagering on this was known as the Wei Seng lottery. The role of Portuguese Governor Ferreira do Amaral – in office from 1846 until his death in 1849 – is pivotal in the history of gaming in Macau and is also discussed in volume one. “He authorised the pacapio lottery in 1846, and it started in January 1847, so that lottery is going to be 170 years old next year,” Mr Godinho stated. The Macao Government Tourism Office describes pacapio as a traditional game introduced to Macau in the late Qing Dynasty when the people of Guangdong bet on pigeon racing. This racing changed to a game similar to a lucky draw based on Chinese calligraphy characters. Today, the game employs numbers instead of text, and manual balloting has been replaced by computerisation. Pacapio games are still available at some locations in Macau, according to the Macao Government Tourism Office. “A total of 170 consecutive years of uninterrupted operation for the pacapio lottery is really something,” Mr Godinho told GGRAsia. Governor Ferreira do Amaral’s own luck ran out in August 1849 when he was killed near Portas do Cerco, the original border gate with mainland China. Before that unhappy event, he had successfully introduced fantan, the first game of chance in Macau – and for more than 100 years, the main game of chance in the city, said Mr Godinho. It is still available in some Macau casinos, generating a modest MOP67 million (US$8.4 million) in revenue in the first quarter of 2016, according to the local regulator, the Gaming Inspection and Coordination Bureau, also known by its Portuguese acronym DICJ. In the 1920s and 1930s correspondence between officials in Lisbon, the Portuguese capital, and Macau showed tensions in relation to the gaming industry, said Mr Godinho. “Macau wanted to have Western games. It wanted to have roulette especially. But Lisbon was always saying ‘No, you cannot have it. You have fantan – fantan is working – keep it’. There was an ongoing tension for years and years. Lisbon was not really allowing an expansion of games of chance in Macau… that only happened in 1961 to 1962, with the concession of STDM,” added Mr Godinho. STDM – or Sociedade de Turismo e Diversões de Macau SARL, controlled by Mr Ho and which was also the predecessor to SJM Holdings – held a monopoly on casino gaming in Macau for 40 years up to 2002. “By the 1960s the Central Hotel was not looking in great shape, and it was necessary to do something to drive tourism and visitation,” stated Mr Godinho, explaining one of the factors influencing the success of STDM’s concession bid. The Central Hotel building in downtown Macau still exists – albeit currently shuttered. For the three decades prior to STDM’s arrival in the market, it was the fashionable place to play fantan in the city. In the late 1970s in the second decade of STDM’s monopoly, baccarat became the main game of chance in Macau, said Mr Godinho. Referring to the basis for STDM’s successful concession bid, the academic stated: “It’s striking that when you read the documents of the 1960s, they seem like they were written last year. They talk about tourism, developing the economy, creating jobs, and so on. It’s extremely familiar language. Even the documents from the 1930s say that [sort of thing]… The fundamental drivers never change,” said Mr Godinho.